Of all varieties in the Coral family, Paeonia Coral Sunset is the most popular one. And there are good reasons for that. First of all Coral Sunset has the thickest stems of all Corals. Also they have the most leaves and the largest flower buds. Finally, Coral varieties are loved because of their orange colour and Coral Sunset happens to be the most orange coloured of them all. Coral Sunset is a semi-double flowered peony with large flowers that can grow up to 20 cm. Similar to Coral Charm this peony transforms from orange to salmon, to cream to white. The strong and green leaves are smoother than from its sibling Coral Charm. Finally the flowers are odourless. Paeonia Coral Sunset was bred in 1965 by Samuel Wissing but is registered by Charles Klehm and Son Nursery. In 1981 they won the APS Gold Medal. 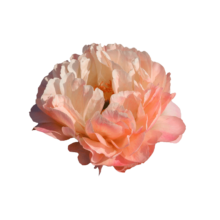 We highly recommended Coral Sunset to lovers of colour changing peonies. Coral Sunset is at its best from mid-May to mid-June.